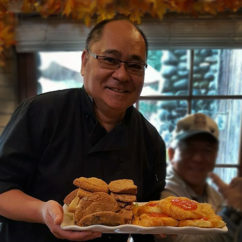 Patrick Choy was born in Hawai’i, one of four siblings in a family that owned and operated Sam Choy’s Kaloko in Kailua-Kona, Hawaii, a James Beard Foundation: America’s Classics Award-winning restaurant. Patrick was 10 years old when his sister was gifted an Easy Bake Oven for Christmas. He quickly “stole” the gift from her and happily tried every Easy Bake Baking Mix available. As he grew older Patrick’s mother encouraged him to pursue a slightly different career path that would set him apart from his chef siblings – he set off to baking school. Upon graduation, Marriott International recruited Patrick as Pastry Chef and he moved up through the ranks to become the corporate baker. After 20 years of traveling Asia, launching corporate Food & Beverage programs for companies ranging from Marriott International to Starbucks, Patrick settled in Seattle with a dream to get back to his roots with a neighborhood bakery. He sources his ingredients from local artisans and farmers as much as possible and enjoys frequent visits from neighborhood regulars who pop in for a toasty cinnamon roll or custom tropical fruit cake. Patrick is embracing a new opportunity for growth and made the bittersweet decision to move the bakery to White Center, Seattle, WA. With a larger floor plan, his expanded menu offers soups and lunch bowl specials in addition to his savory and sweet pastries. I look forward to sharing my family’s traditions and my love and passion for baking with you, come on in!